The spring 2013 semester ended on quite the high note for me, when the University President honored me with the President’s Award for Excellence in Undergraduate Teaching. When you work at a place like I do where all your colleagues not only love to teach but are also quite good at it, this kind of recognition means a lot. The bar is high here and I was delighted with the recognition. As the most recent recipient of this award, the office of academic affairs invited me to give the faculty address at our Fall convocation ceremony that took place this last Friday (August 23rd). Of course I was happy to oblige. The orientation planning committee asked that I follow a theme with my remarks, something to the effect of “using a compass to navigate your future.” Blending that theme with my own interests in promoting healthy achievement motivation proved to be a bit challenging, but it wasn’t beyond me, after all. During the speech folks laughed, nodded, and smiled in all the right places. Afterwards parents sought me out to offer their congratulations and to tell me that they took notes! I thought I’d share my remarks with my wordpress community as well– I hope you enjoy! Perhaps these words can help you start off the new school year with a fresh perspective too. Hi everyone! I am delighted that you all found your way here today, to this opening ceremony that marks the start of a new academic year – your first year here at Pacific University. How exciting. And how daunting. I expect that there’s a lot going on in in your minds right now – some questions, some anticipation, some certainty, and some uncertainty. How will you find your way with it all? I see fixed points indicating the magnetic poles. 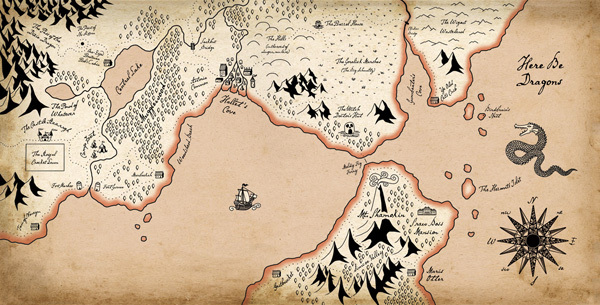 If I were navigating uncharted territory, say, as an explorer who has fallen off the face of the map finding myself in that area medieval cartographers labeled with the words “here be dragons” and illustrated with fantastical creatures, a compass could surely help me find my way out of that mess. But that’s not where we are, is it. For some of you, you really have fallen off the map – college is uncharted territory and you very well may feel like dragons are lurking in dark corners! [if that’s you though, never fear — Boxer isn’t actually a dragon…]. Some of you have already been to college though and have just transferred here. For you, the concept of college is more familiar, so you are little more, rather than less, certain about where you are. But despite whether you have script for “going to college” or not, for all of you, this place right here under your feet is new. You are living in a new place, seeing new faces, walking along new paths. Before long – likestarting Monday – you’ll be thinking new thoughts, reading new books, and doing new things too. So you all get to navigate this new territory and must carve out a path in order to reach your educational destination. Which direction will you head? Back to my first question then, how will you find your way with it all? What does the compass and “mapping uncharted territory” analogy do for you here? It gives us a starting place to begin thinking about how you will find your way. What are the cardinal directions in college? Here at Pacific the cardinal directions are the fields of study that together comprise the “Liberal Arts.” Just like knowing the possible directions you can go (N,S,E,W) when navigating real terrain helps you chart a physical route, the fields of study in the liberal arts framework help you navigate a meaningful path through the scholastic terrain. The compass rose for scholastics would somehow display the fields of study and demarcate points of connection among them. A little device like this doesn’t really exist; at least not like this [hold up compass]. 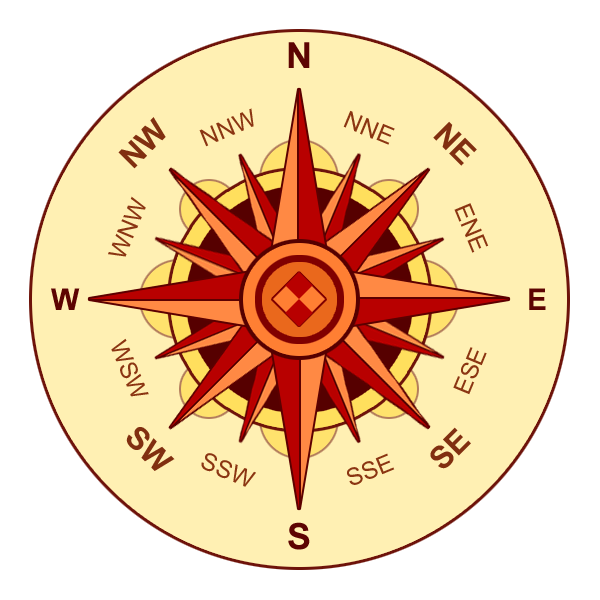 Figuratively speaking though, there is an analogue to the compass rose – it’s your core graduation requirements. “The Core” shows the cardinal fields of study and even includes some possible points of connection among them. Unlike the compass rose here though (hold up compass), the points of connection among the cardinal fields of study are not fixed. As a student, one of your tasks is to create your own points of relation among the cardinal fields of study. In other words, you will build your own compass rose to help you chart your course towards graduation. On a physical compass, where everything is fixed, the needle tells you where you are in relation to those cardinal directions. But as I’ve just said, the relations in our scholastic compasses aren’t fixed. So you have some work to do here. First, you have to map out the relations amongst the cardinal fields of study and then you have to get started with a course schedule. As you do this though you don’t have to start from scratch — we give you a starter set. Your starter set contains options: choices in focal studies, majors, and minors. Just like using a real compass, charting and utilizing the program evaluation takes some practice. You have many resources to help you with this though – the advising center, your faculty advisor, and your peers. As we work together on this, you will find you way. Compasses work by responding to the Earth’s own magnetic fields. With a fixed point — “true north” — and a physical pull the device works. Without fixed points and physical forces, it’s just a piece of junk or a pretty picture on your orientation materials. Just like an actual compass, without a fixed point and without a physical force, the program evaluation is useless. What makes your scholastic compass work? The force that makes your needle move is your own sense of self and the quality of your motivation for success in school. You determine “true north” as you get to know yourself, your interests, your strengths, and your weaknesses. Once you’ve found yourself, your “true north” will be fixed by your goals for life after college. You make the needle move as you engage in your studies. So the compass rose contains fields of studies and the connections you make among them. The compass needle is your progress towards graduation. And the force that makes the needle move is your achievement motivation. When we are working hard and moving forward, we are experiencing higher quality motivation. When we lay in bed and hit snooze we are experiencing lower quality motivation. In both cases you are motivated. What differs is the quality. The quality of your motivation depends on the orientation of your sense of control, of which there are two extremes. On one end of the continuum is internal motivation, where you feel like you are fully in control of your actions and outcomes. When explaining your behavior, you note that your successes and your failures come from your own actions. On the other end of the continuum is external motivation, where you feel like something else – something outside you — controls your actions and outcomes. When explaining your behavior, you state that circumstances or luck caused your outcomes, not your own actions. Both orientations can cause forward motion, but one orientation will move you further ahead – can you guess which one? Yes, that’s right, Internal. When you feel like you are in control, you work harder and achieve more. So how do you get that feeling? Turns out that it comes from a relationship between you and your environment. Relationships are two-way streets. Here at Pacific we all have a job to do, in terms of establishing the conditions necessary for you all to experience the kind of high quality internal motivation that will enable you to reach “E marks the spot” on your scholastic treasure maps. You have a job to do, and so do we. We are the environment that you will interact with, and when we all work together, you will find your way to the goals you seek. Let me tell you about how this works. Three factors interact, shaping your achievement motivation: 1. Your sense of community, 2. Your sense of competence, 3. Your sense of autonomy. Let me tell you how this works. When you feel like you are a valued member of your community, you feel more engaged and you achieve more. We all have a role to play in this, faculty and students alike. Our job is to get to know you, and we will. We will learn your names and we will ask you questions about yourselves and your interests. We will provide you with opportunities to talk with us. Your job is to let yourself be known. Talk with us, participate in class, and come to office hours in person. Get to know your classmates too: when given an opportunity to talk with your classmates do so! Go to a study group, and go out on a social excursion or two or three. Together, we will build community and this will help you achieve. You feel competent when you know what it will take to succeed at a task, assignment, or academic challenge. When you have this kind of self-knowledge, you achieve more. We all have a role to play in building your sense of competence, faculty and students alike. Your job is to take the feedback to heart and use it to plan your next steps. Repeat or better yet improve upon the good and change the not-so-good. As this cycle of feedback and growth perpetuates itself, you will learn what it takes to succeed and your internal motivation will grow, boosting your achievement along the way. When you have a say in charting your immediate future, you feel autonomous – or independent and in control. Strong autonomy gives you the kind of control that boosts your achievement. Making choices nurtures internal motivation. We all have a role to play here too, faculty and students alike. Our job is to offer you choices. You get to do this on many levels. You choose your focal studies, your major, a minor if you like, and many electives besides. In some classes, you will choose your assignments, or topics therein. Some choices will be wide open, others more constrained, but rest assured that you will have a say over much of what you do here. Your job is to make meaningful choices and to take ownership of your work. Sometimes you’ll get to choose based on personal interest – these cases naturally boost your internal motivation. Other times, you may not find an option that initially “grabs” you, but if you go into your choice with an open mind, and a mind-set that you are sure to learn something no matter what (which is always the case! ), you will boost your sense of control. When you make the most of the choices ahead of you, your sense of control will grow and you will achieve more. Noticeably missing from my discussion here on achievement motivation is “intellect” or “smarts.” Psychologists have yet to definitively figure out just what intelligence is and as it turns out, knowing your IQ means very little in terms of achievement. In fact, labeling yourself with an IQ, a learning style, or your personal strength can unnecessarily limit you. Rather, attention to fostering internally orientated motivation does boost achievement, no matter what you think about your intelligence. When you think about where you are now and use that as a baseline for growth, you will grow. Sounds simple, right? Right. It is if we all keep up our ends of the bargain. You do your job, and we will do ours. Healthy motivation and a growth-oriented mind-set are your keys to success. As long as you make good choices, engage, and connect with others, you will reach “E marks the spot” on your treasure maps and navigate yourselves right into a very bright future. So let’s get on with it – draw those treasure maps and start discovering. Your education awaits you. Next What is the purpose of education? good talk Erica, I they take it to heart. Thanks! One new student came to my office later that day and wanted to talk about it! I’ll take that as a good sign. Great choice Erica, I love your words and encouragement. Thank you! I will bookmark the page to carry on reading tomorrow! And thank you, too! Happy reading.